The act of gathering and eating is what compels the art I make. Through functional pottery I am able to convey a sacred idea; that we should gather, make food and eat together. The sculpture I create extends my thoughts beyond the table, using symbolic schema and historically inspired forms like tablets, tools and weapons. I learned to work in my childhood home. Stacking firewood and tending the garden were common. That time has inspired my present life as a child-rearing homemaker and dedicated gardener. 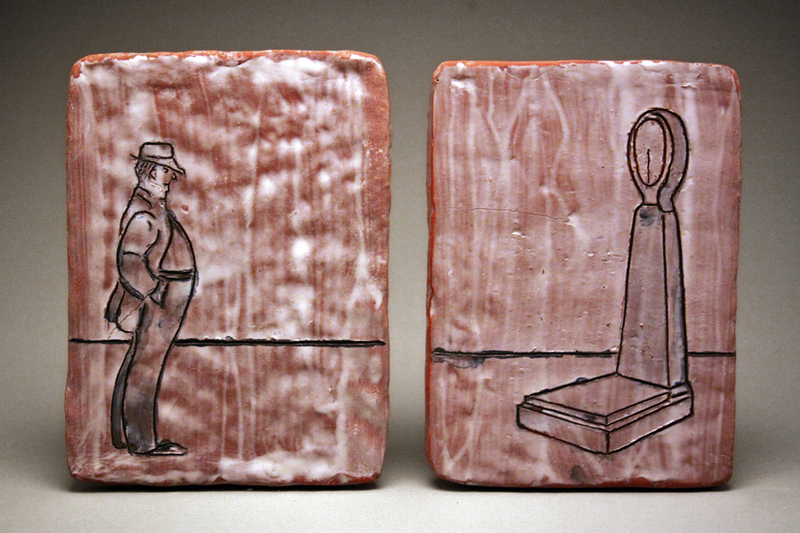 I’m an outlier in the traditional world of domesticity and this has influenced my work in ceramics. Currently, making pottery and growing food is the bulk of my effort. This adjustment reveals a message; home making and handmade pots are essential because we need to gather and eat. The forms I make are full in volume but reserved in character. I use brick clay that is mined in Southern Nebraska, near Endicott. 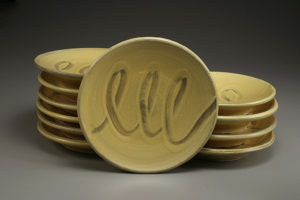 It is fired to a mid-range temperature of 2150 degrees F. Throwing on a wheel, pinching and coiling, and pounding flat slabs are my typical forming techniques. A way to describe my decorative technique is analogous to how I dress. Pots are painted on the inside with a white slip, like a t-shirt. That gets covered with a bright colored glaze, like a dress shirt. I paint a dull matte slip on the exterior to unify the form, like a coat. I prefer earth tones on pottery exteriors, and sometimes interrupt this surface with spots, stripes or non-representational characters. Sculptures are painted with varied colors of slip, drawn through and stained with oxides. I use illustrative images to convey contemplations about the world I experience. 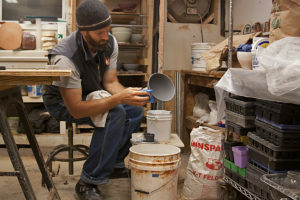 The place of pottery in everyday life helps me to recognize the potentials it has for building a community – we should gather and eat, drink and discuss. I am compelled to make art because it engages my intellect and allows me to express what I read and think about. 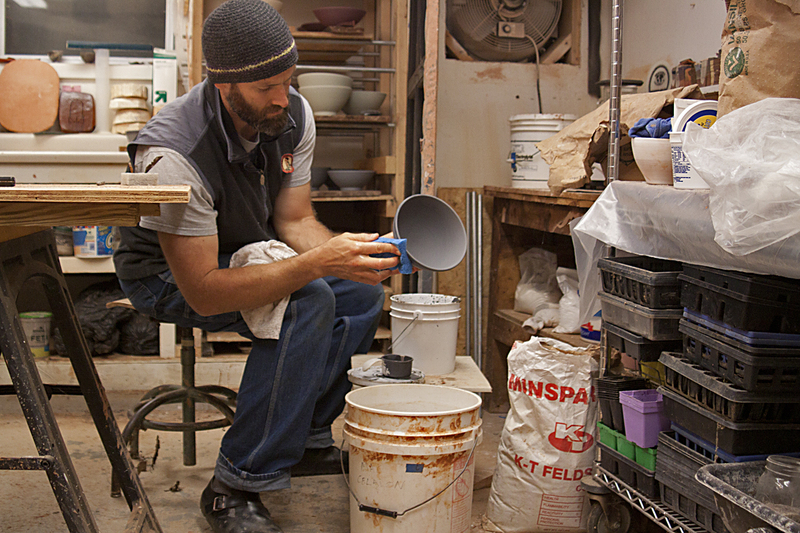 The fundamental process of transforming clay engages my curiosity and rewards my mental and physical effort. PETER SCHERR was born and raised in Hastings, Nebraska. 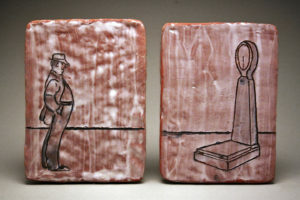 He is a ceramic artist – making both functional and sculptural pieces – living and working in Bellevue, Nebraska. 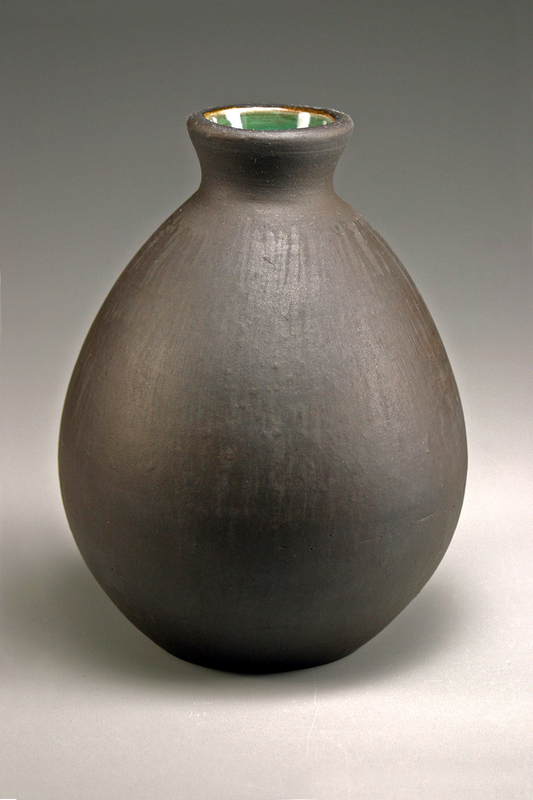 Peter assisted in the studio of Jun Kaneko (1999-2000) where he learned and experienced the labors of a studio practice. He later received his BFA (2005) from The University of Nebraska-Lincoln, under the tutelage of Gail Kendall, Eddie Dominguez, and Pete Pinnell. He and his wife live and garden on an acre South of Omaha, raising two young daughters, a toddler son, and laying hens. History, trains and food are his favored discussion themes.